A number of new commercial online services have emerged in recent years, each promising to reshape some aspect of the way Americans go about their lives. Some of these services offer on-demand access to goods or services with the click of a mouse or swipe of a smartphone app. Others promote the commercialized sharing of products or expertise, while still others seek to connect communities of interest and solve problems using open, collaborative platforms. These services have sparked a wide-ranging cultural and political debate on issues such as how they should be regulated, their impact on the changing nature of jobs and their overall influence on users’ day-to-day lives. A national Pew Research Center survey of 4,787 American adults – its first-ever comprehensive study of the scope and impact of the shared, collaborative and on-demand economy – finds that usage of these platforms varies widely across the population. In total, 72% of American adults have used at least one of 11 different shared and on-demand services. And some incorporate a relatively wide variety of these services into their daily lives: Around one-in-five Americans have used four or more of these services, and 7% have used six or more. College graduates – 39% of college graduates have used four or more of these services, compared with just 8% of those with a high school degree or less. At the same time, around one-quarter of college graduates have used none (11%) or only one (15%) of these services. Those with relatively high household incomes – 41% of Americans with an annual household income of $100,000 or more have used four or more of these services, three times the proportion among households earning less than $30,000 annually. Those under the age of 45 – Exposure to these shared and on-demand services begins to drop off rapidly starting at around age 45. Around one-third of those ages 18-44 have used four or more of these services, and relatively few in this age range have no exposure at all to these services. By contrast, 44% of Americans ages 50 and older (and 56% of those ages 65 and older) have not used any of these 11 platforms. A number of these services – though by no means all of them – are offered primarily in and around urban population centers. And urban and suburban residents are around twice as likely as those living in rural areas to use four or more of these services. At the same time, around one-quarter of urban and suburban dwellers have not used any of the platforms measured in this survey. This report offers a detailed examination of three different services that exemplify the shared, collaborative and on-demand economy: ride-hailing apps, home-sharing platforms and crowdfunding services. Key findings about each of these three services are discussed in more detail below. When presented with a number of attributes that might describe ride-hailing apps, users respond especially strongly to two in particular: 86% of ride-hailing users feel that these services save their users time and stress, while 80% feel that they offer good jobs for those who want flexible working hours. Users also broadly agree that these services could be a good transportation option for older adults with limited mobility, and that they are less expensive than traditional taxi services. Ride-hailing users are more divided on questions such as whether or not these services simply help serve people who already have plenty of transit options available to them, and whether they are a good way to transport unaccompanied minors. But relatively few (11%) think that these services collect too much personal information about their users. And a sizable majority of users feel that these services use drivers that they feel safe riding with (70% feel that this describes these services well, while just 5% disagree). Some 3% of American adults use ride-hailing apps on a daily or weekly basis, and around two-thirds of these regular ride-hailing users indicate that they own a car or regularly drive a personal vehicle. 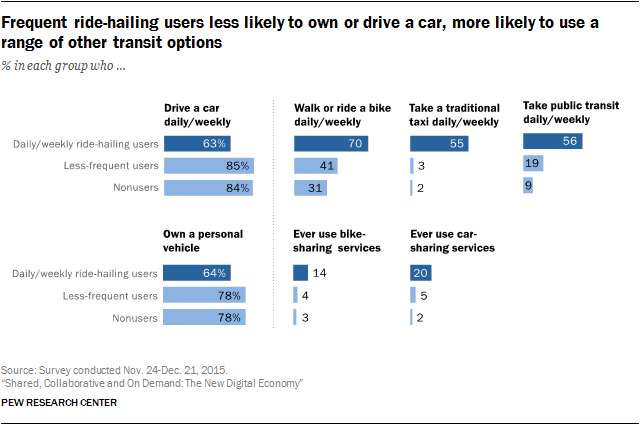 Although this means that a majority of these regular ride-hailing users are car owners/drivers, they are significantly less likely to own or drive a car than either occasional ride-hailing users or Americans who do not use ride-hailing at all. Yet although they are less dependent on personal vehicle ownership, these regular ride-hailing users rely heavily on a wide range of personal transportation options that go well beyond ride-hailing alone – such as taking public transit, walking or riding a bike, or even using traditional taxi services. To be sure, this trend carries a strong geographic component: For Americans who live far from urban centers, a personal vehicle might be the only available option to get from one place to another. But for those with the option of doing so, ride-hailing apps can serve as one element among many in a network of transportation options that can help reduce users’ reliance on personal vehicle ownership. Just 15% of Americans have used ride-hailing apps themselves, but nearly half of all adults (48%) have heard at least something about the debate happening in cities across the country over how best to regulate these services. Ride-hailing users themselves are following this issue especially closely: Fully 85% of ride-hailing users have heard at least something about this debate, and 39% indicate that they have heard “a lot” about it. When it comes to their views on how to best regulate these services, the public at large is relatively split. Among Americans who have heard of this issue, 42% feel that these services should not be required to follow the same rules and regulations as existing taxi companies when it comes to things like pricing, insurance or disability access; 35% think that they should have to follow these rules, while the remaining 23% are not sure how they feel. But although the engaged segment of the general public is relatively divided, ride-hailing users themselves tend to favor the notion (by a two-to-one ratio) that these services should not have to follow the same rules and regulations as legacy taxi operators. Among ride-hailing users who have heard of this debate, 57% believe that these services should not be required to follow the existing regulations that are in place for incumbent providers, while just 27% believe that existing rules and regulations should in fact apply to these new market entrants. Ride-hailing apps are one of the leading examples of the so-called gig economy, but many users are not entirely clear about the nature of the relationship between these services and the drivers who use them. In the abstract, users tend to view these services as software platforms rather than transportation companies, and they view their drivers as independent contractors rather than employees. Some 58% of ride-hailing users view these apps as software companies that simply connect drivers with people who are looking for a ride, while 30% view them as transportation companies that have a great deal of control over their drivers and the overall customer experience. Similarly, 66% of ride-hailing users think of the drivers who work for these services as independent contractors, while 23% view them as employees of the app or service. 62% of users believe that both drivers and services should be responsible for making sure that the vehicles that customers request are clean and safe. Some 12% think this is the responsibility of the services alone, while 24% think it is up to individual drivers to ensure this. Ride-hailing apps are discussed in detail in Chapter 2 of this report. Around one-in-ten Americans have used a home-sharing site such as Airbnb or HomeAway to stay in someone’s home for a period of time – and these services appeal to a relatively broad age spectrum in comparison with ride-hailing apps. Americans ages 35-44 are nearly twice as likely as those ages 18-24 to have used home-sharing services (16% vs. 9%), and the median age of home-sharing users in the United States is 42 – nearly a decade older than the median ride-hailing user. When presented with several attributes that might define home-sharing services, users respond especially strongly to the notion that these services are a good option for families or people who travel as a group (87% of users feel that this describes home-sharing sites well), and that they are a good way for homeowners to earn extra money (85%). At the same time, many users of these sites view home-sharing as something that is perhaps not for everyone. Roughly half of users (53%) say these services are best-suited for adventurous travelers; 42% say the properties on these sites are not always as appealing as they seem online; and around one-in-five (18%) say they are generally risky to use. Some 37% of home-sharing users report that they have used these services to reserve a single room or other type of shared space in someone’s home (this works out to 4% of all American adults). However, many of these users express some level of reservation about doing so. Some 48% of those who have stayed in this type of shared lodging say they worry about staying with someone they have never met before, and 66% of these users feel that home-sharing services are best for adventurous travelers. In addition, these users are twice as likely to have had a bad experience using home-sharing compared with other users. Much like ride-hailing apps in the context of the employer/worker relationship, home-sharing services are structured much differently from traditional hotels – and consumers are not always clear on the precise nature of this new arrangement. Some 58% of home-sharing users indicate that they see these services as software companies whose business is simply connecting people with a spare room or empty house with others who are looking for a place to stay. At the same time, 26% view them as hospitality companies that vouch for the quality of the properties they list and have a good deal of control over the customer experience. 67% of home-sharing users believe that both individual homeowners and the services themselves should be responsible for making sure that properties are described accurately. Some 8% think it is the sole responsibility of the app or service that people use to book their stay, while one-quarter (23%) believe it is the sole responsibility of individual homeowners. 57% of users believe that both homeowners and services should be responsible for resolving payment issues between hosts and guests. Some 31% think this is the responsibility of the services alone, while 11% think it is the responsibility of individual homeowners. 53% of users believe that both homeowners and services should be responsible for addressing problems that might come up during someone’s stay. One-in-ten (10%) believe that this is the sole responsibility of the app or service, while 35% believe it is the responsibility of the homeowner alone. But although home-sharing users have not been following the legal debate over these services with nearly the same intensity as their ride-hailing counterparts, those home-sharing users who have been following this issue tend to feel that these services should be both legal and tax-free for owners. Among home-sharing users who are aware of the legal debate over these services, 56% believe that these services should be legal, and that owners should not have to pay any local hotel or lodging taxes; just 31% believe that owners should be able to legally rent out these services but should have to pay taxes for the privilege of doing so. Home-sharing sites are discussed in more detail in Chapter 3. Around one-in-five American adults have contributed to an online fundraising project on a site like Kickstarter or GoFundMe, and 3% of Americans have created their own fundraising project on one of these sites. The overwhelming majority of crowdfunding users have contributed to a handful of projects: Some 87% of donors say they have contributed to a total of five projects or fewer on these sites. And while 62% of donors have given $50 at most to an individual project, relatively large donations are not uncommon: 21% of these donors have given between $51 and $100 to an individual project, 14% have given between $101 and $500, and 3% have donated more than $500 at one time. 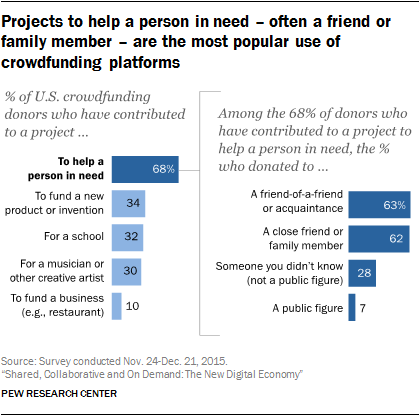 34% of crowdfunding donors have contributed to a project to fund a new product or invention. 32% have contributed to a project for a school. 30% to a project for a musician or other creative artist. 10% to a project for a new restaurant or other type of business. Contributions to help someone in need are more often directed toward a person who is already known by the donor, as opposed to a stranger or a public figure. Among those who have contributed to a crowdsourced project to help someone in need, 63% say they have given to help a friend of a friend or an acquaintance, while 62% have contributed to help a close friend or member of their family. By contrast, just 7% of these donors have given to a campaign to assist a public figure, while 28% have given to help someone who was not a public figure but whom they did not know personally. Men and women differ in a number of ways when it comes to their use of crowdfunding platforms. Male donors are roughly twice as likely as female donors to have contributed to six or more projects, and are also nearly twice as likely to have contributed more than $100 to an individual project. 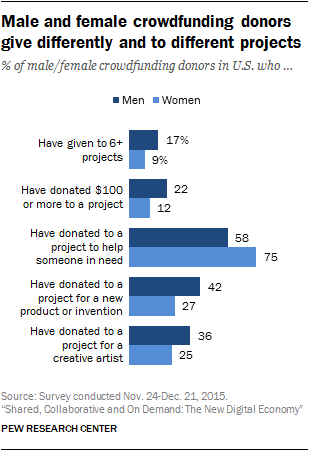 And while women are more likely to contribute to a project to help someone in need, men are more likely to help fund new products or inventions, as well as projects for musicians or other creative artists. Younger men are especially interested in funding new products and inventions: 48% of men ages 18-49 who have made a crowdfunding donation have contributed to this type of project. Crowdfunding sites are discussed in more detail in Chapter 4. Men and women are equally likely to use most shared and on-demand platforms, but women are twice as likely as men to buy handmade or artisanal goods online: 29% of women have done this, compared with 15% of men. A cohort of young adults uses ride-hailing apps with great intensity: 7% of all 18- to 29-year-olds (and 10% of 18- to 29-year-olds living in urban areas) indicate that they use ride-hailing on a daily or weekly basis. 27% of Americans are aware of ride-hailing apps and indicate that they live in an area where these services are offered, but have not yet tried ride-hailing themselves. Users’ views on how best to regulate ride-hailing and home-sharing services stand in contrast to their overall political leanings. Even users of these services who are politically liberal tend to support the notion that they should be legal and tax-free (in the case of home-sharing), or that they should be free to operate outside of existing regulatory structures (in the case of ride-hailing). Men and women tend to perceive and experience these services somewhat differently when it comes to the issue of user safety – though these differences are not always dramatic or consistent. For instance, women are more likely than men to express safety concerns about the drivers used by ride-hailing services, and women are also more likely to report having a bad experience using a home-sharing site. At the same time, a substantial majority of female ride-hailing users indicate that these services do indeed use drivers that they feel safe riding with. And female home-sharing users are no more likely than men to view these services as risky to use. 2% of Americans have contributed to an online fundraising project to help someone in need primarily because they felt socially obligated to do so. 6% of women ages 18-49 have started their own online fundraising project, double the figure for the population as a whole.